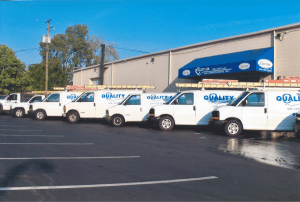 Since 1983, Quality Air Heating and Air Conditioning has been providing excellent HVAC services to Columbus, OH. We pride ourselves on our customer’s satisfaction, and we understand you expect nothing but the best for your family. This is why our family owned heating and cooling company employs professional HVAC technicians who are certified and qualified to get the job done right the first time. We are quick, clean, and leave your home looking the same as it did before we set foot on your property. To learn more about our HVAC services, give us a call at 614.262.1818 today! Trust our heating specialists to repair and service your furnace this year. Our furnace service can help keep your system running optimally, reducing your energy bill and reducing the wear and tear on your heating system. We also understand that emergencies happen, and we can help you repair your furnace 24/7. Our staff is always looking to do what is right for our customer, and sometimes slapping a band-aid on an old furnace can end up costing you more than a new unit in the long run. We will work with you to explain whether repairing your old furnace is the right move, or if a new Carrier furnace installation is the smart way to go, considering cost-savings and reliability. It’s hard to imagine a hot summer day without air conditioning, and for some, it’s a necessity due to medical issues. Quality Air Heating and Air Conditioning is here to help keep your AC system running smoothly with routine AC service that will help keep dust off the components of your AC unit, allowing it to run more efficiently and reliably. If you do have a breakdown, we can also help affordably replace, or repair your old air conditioner. If you experience any trouble with your AC system this year, give Quality Air Heating and Air Conditioning a call! Great service & excellent price. Excellent service and a great price. From the first person I encountered which was Don the service technician, Ryan , the salesman and Shaw and Vince the service was really great. I trusted each one of their recommendations and their work. I was without heat and their speedy turnaround time has me now with a new furnace and a warm house. Thanks to all. Called in the morning because of a compressor failure. The stopped by in the early afternoon and had things working in a matter of minutes. Glad I had them come out. Ryann came and determined repair was better value than replacement at this time. Called Nick and had repair done in minutes. Customer for life!